How to create your personal website using free tools only. How to include text pictures and videos. How to use easy java scripts. How to make your site responsive to smartphones. Learn it all with this amazing ebook that will unleash your creativity. ROME, Italy - Oct. 29, 2016 - PRLog -- If you are looking for some sort of magically simple, unparalleled ebook on basic web design, you've found it: "My Website At Last!" 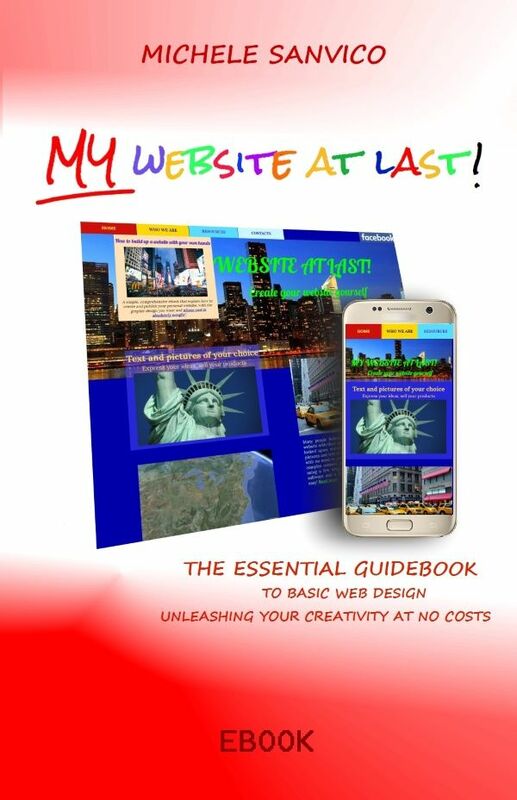 is a guidebook dedicated to all the people who wish to develop their own website as a personal showcase, but have no clue where to start from and - not a minor requirement - are unwilling to spend any money in the process. They are looking for an easy way to design and publish their site, and they want to do it for free. "My Website At Last!" is not intended for computer geeks. It is an easy, step-by-step guidebook providing the reader with crystal-clear directions on how to create his/her own website from scratch: guidance includes where to place the site in the web (for free), how to communicate with it (for free, too), how to edit the site's basic files (again, at no costs), how to include text, images and videos in it (using free, public domain pictures) and much more. In addition to that, the guidebook will show how to use simple Java scripts to improve site's attractiveness. Finally, the site will be rendered responsive to PCs, tablets, and smartphones, as is needed today when a new website is launched in a world populated by surfers provided with countless handheld devices. A wearisome task? Not in the least. With "My Website At Last! ", you just have to copy portions of instruction code from the ebook and paste them into your website, and - magically enough - your website will gradually take shape in your browser before your very eyes. No need to attend programming classes nor study tedious handbooks on web design: your website will undergo a fast creation process, as you paste and copy code chunks from the ebook. Check the resulting effect in your browser and compare it with the expected result shown in the many color pictures contained in the ebook. Easily done, easily completed. And easily adapted to the website you have in mind, by simply customising and replicating the proposed code chunks the way you wish: place the text and pictures where you want, define colors at will, pick the fonts you like, etc. «Everything you always wanted to know about how to build your personal website, but nobody ever told you», said Michele Sanvico, an Italian writer of literary fiction and creative nonfiction. «Now, no more fear: this is a journey into basic web design anyone can take. Follow the step-by-step guidance and publish your site in a very short time without spending a single dime. You will be surprised to see your personal website gradually appear on your browser's screen, with pictures, text blocks and even a sample video. The astounding feature of this ebook is that you are not required to know HTML, CSS and Java: your new site will come out as an easy and straightforward copy-and-paste process from the ebook, and you will also be in full control of the final look-and-feel». "My Website At Last!" is an amazing ebook which empowers the reader with all the tools he/she needs to build up an attractive personal website. A simple, easy way to enter the web arena without incurring any development costs. For additional information, visit Amazon's bookstore (https://www.amazon.it/dp/B01M707UBP) or Smashwords's ebook platform (https://www.smashwords.com/books/view/674347).